The ability of an SPD to limit overvoltages on the electrical distribution network by diverting surge currents is a function of the surge-protective components, the mechanical structure of the SPD, and the connection to the electrical distribution network. An SPD is intended to limit transient overvoltages and divert surge current, or both. It contains at least one nonlinear component. In the simplest terms, SPDs are intended to limit transient overvoltages with a goal of preventing equipment damage and downtime due to transient voltage surges reaching the devices they protect. For example, consider a water mill protected by a pressure relief valve. The pressure relief valve does nothing until an over-pressure pulse occurs in the water supply. When that happens, the valve opens and shunts the extra pressure aside, so that it won’t reach the water wheel. If the relief valve was not present, excessive pressure could damage the water wheel, or perhaps the linkage for the saw. Even though the relief valve is in place and working properly, some remnant of the pressure pulse will still reach the wheel. But pressure will have been reduced enough not to damage the water wheel or disrupt its operation. This describes the action of SPDs. They reduce transients to levels that will not damage or disrupt the operation of sensitive electronic equipment. What technologies are used in SPDs? From IEEE Std. C62.72: A few common surge-protective components used in manufacturing SPDs are metal oxide varistors (MOVs), avalanche breakdown diodes (ABDs – formerly known as silicon avalanche diodes or SADs), and gas discharge tubes (GDTs). MOVs are the most commonly used technology for the protection of AC power circuits. The surge current rating of an MOV is related to the cross-sectional area and its composition. In general, the larger the cross-sectional area, the higher the surge current rating of the device. MOVs generally are of round or rectangular geometry but come in a plethora of standard dimensions ranging from 7 mm (0.28 in) to 80 mm (3.15 in). The surge current ratings of these surge protective components vary widely and are dependent on the manufacturer. As discussed earlier in this clause, by connecting the MOVs in a parallel array, a surge current value could be calculated by simply adding the surge current ratings of the individual MOVs together to obtain the surge current rating of the array. In doing so, consideration should be given to coordination of the operating characteristics of the MOVs selected. There are many hypotheses on what component, what topology, and the deployment of specific technology produces the best SPD for diverting surge current. Instead of presenting all of the options, it is best that the discussion of surge current rating, Nominal Discharge Current Rating, or surge current capabilities revolve around performance test data. Regardless of the components used in the design, or the specific mechanical structure deployed, what matters is that the SPD has a surge current rating or Nominal Discharge Current Rating that is suitable for the application. A more extensive description of these components follows. Typically, MOVs consist of a round or rectangular shaped body of sintered zinc oxide with suitable additives. Other types in use include tubular shapes and multilayer structures. 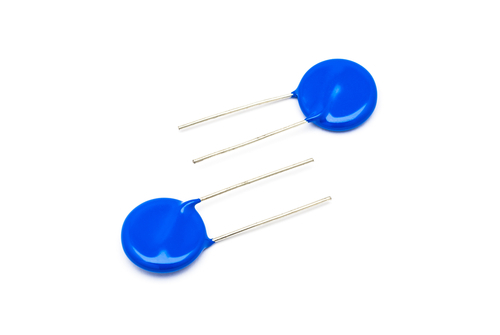 Varistors have metal particle electrodes consisting of a silver alloy or other metal. The electrodes may have been applied to the body by screening and sintering or by other processes depending on the metal used. Varistors also often have wire or tab leads or some other type of termination that may have been soldered to the electrode. 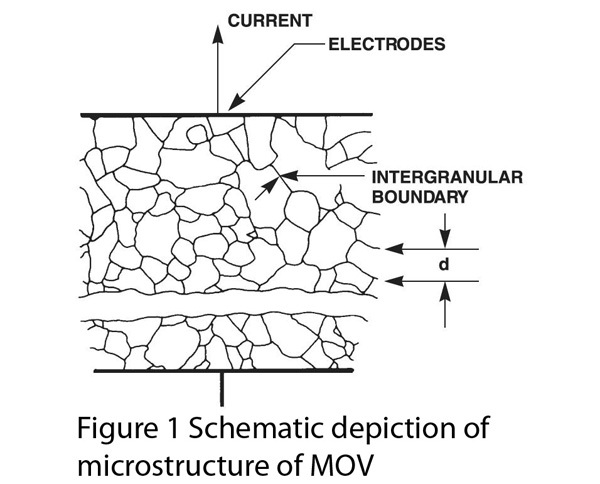 The basic conduction mechanism of MOVs results from semiconductor junctions at the boundary of the zinc oxide grains formed during a sintering process. The varistor may be considered a multi-junction device with many grains acting in series-parallel combination between the terminals. A schematic cross-sectional view of a typical varistor is shown in Figure 1. Varistors have the property of maintaining a relatively small voltage change across their terminals while the surge current flowing through them varies over several decades of magnitude. This nonlinear action allows them to divert the current of a surge when connected in shunt across the line and limit the voltage across the line to values that protect the equipment connected to that line. These devices are also known as silicon avalanche diode (SAD) or transient voltage suppressor (TVS). 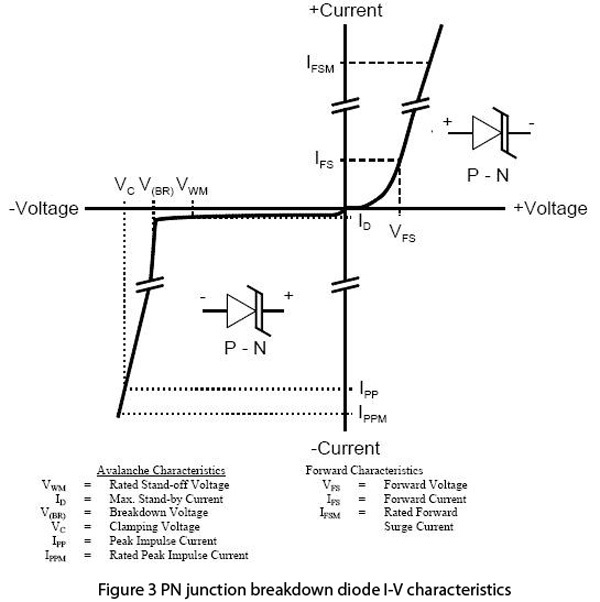 The P-N junction breakdown diode, in its basic form, is a single P-N junction consisting of an anode (P) and a cathode (N). See Figure 2a. In DC circuit applications, the protector is reverse biased such that a positive potential is applied to the cathode (N) side of the device. See Figure 2b. The avalanche diode has three operating regions, 1) forward bias (low impedance), 2) off state (high impedance), and 3) reverse bias breakdown (relatively low impedance). These regions can be seen in Figure 3. In the forward bias mode with a positive voltage on the P region, the diode has very low impedance once the voltage exceeds the forward bias diode voltage, VFS. VFS is usually less than 1 V and is defined below. The off state extends from 0 V to just below a positive VBR on the N region. In this region, the only currents that flow are temperature dependent leakage currents and Zener tunneling currents for low breakdown voltage diodes. The reverse bias breakdown region begins with a positive VBR on the N region. At VBR electrons crossing the junction are accelerated enough by the high field in the junction region that electron collisions result in a cascade, or avalanche, of electrons and holes being created. The result is a sharp drop in the resistance of the diode. Both the forward bias and reverse bias breakdown regions can be used for protection. The electrical characteristics of an avalanche diode are intrinsically asymmetric. Symmetric avalanche diode protection products consisting of back to back junctions are also manufactured. Gas discharge tubes consist of two or more metal electrodes separated by a small gap and held by a ceramic or glass cylinder. The cylinder is filled with a noble gas mixture, which sparks over into a glow discharge and finally an arc condition when sufficient voltage is applied to the electrodes. When a slowly rising voltage across the gap reaches a value determined primarily by the electrode spacing, gas pressure and gas mixture, the turn-on process initiates at the spark-over (breakdown) voltage. Once spark-over occurs, various operating states are possible, depending upon the external circuitry. These states are shown in Figure 4. At currents less than the glow-to-arc transition current, a glow region exists. At low currents in the glow region, the voltage is nearly constant; at high glow currents, some types of gas tubes may enter an abnormal glow region in which the voltage increases. Beyond this abnormal glow region the gas discharge tube impedance decreases in the transition region into the low-voltage arc condition. The arc-to-glow transition current may be lower than the glow-to-arc transition. 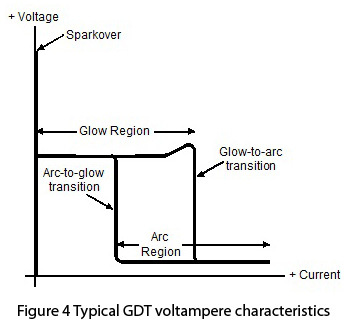 The GDT electrical characteristic, in conjunction with the external circuitry, determines the ability of the GDT to extinguish after passage of a surge, and also determines the energy dissipated in the arrester during the surge. If the applied voltage (e.g. transient) rises rapidly, the time taken for the ionization/arc formation process may allow the transient voltage to exceed the value required for breakdown in the previous paragraph. This voltage is defined as the impulse breakdown voltage and is generally a positive function of the rate-of-rise of the applied voltage (transient). A single chamber three-electrode GDT has two cavities separated by a center ring electrode. The hole in the center electrode allows gas plasma from a conducting cavity to initiate conduction in the other cavity, even though the other cavity voltage may be below the spark-over voltage. Because of their switching action and rugged construction, GDTs can exceed other SPD components in current-carrying capability. Many telecommunications GDTs can easily carry surge currents as high as 10 kA (8/20 µs waveform). Further, depending on design and size of the GDT, surge currents of >100 kA can be achieved. The construction of gas discharge tubes is such that they have very low capacitance – generally less than 2 pF. This allows their use in many high-frequency circuit applications. When GDTs operate, they may generate high-frequency radiation, which can influence sensitive electronics. It is therefore wise to place GDT circuits at a certain distance from the electronics. The distance depends on the sensitivity of the electronics and how well the electronics are shielded. Another method to avoid the effect is to place the GDT in a shielded enclosure. A gap, or several gaps with two or three metal electrodes hermetically sealed so that gas mixture and pressure are under control, designed to protect apparatus or personnel , or both, from high transient voltages. A gap or gaps in an enclosed discharge medium, other than air at atmospheric pressure, designed to protect apparatus or personnel , or both, from high transient voltages. From IEEE Std C62.72: The ability of an SPD to limit overvoltages on the electrical distribution network by diverting surge currents is a function of the surge-protective components, the mechanical structure of the SPD, and the connection to the electrical distribution network. A few common surge-protective components used in manufacturing SPDs are MOVs, SASDs, and gas discharge tubes, with MOVs having the largest usage. The surge current rating of an MOV is related to the cross-sectional area and its composition. In general, the larger the cross-sectional area is, the higher the surge current rating of the device. MOVs generally are of round or rectangular geometry but come in a plethora of standard dimensions ranging from 7 mm (0.28 in) to 80 mm (3.15 in). The surge current ratings of these surge protective components vary widely and are dependent on the manufacturer. By connecting the MOVs in a parallel array, a theoretical surge current rating could be calculated by simply adding the current ratings of the individual MOVs together to obtain the surge current rating of the array. There are many hypotheses on what component, what topology, and the deployment of specific technology produces the best SPD for diverting surge current. Instead of presenting all of these arguments and letting the reader decipher these topics, it is best that the discussion of surge current rating, Nominal Discharge Current Rating, or surge current capabilities revolve around performance test data. Regardless of the components used in the design, or the specific mechanical structure deployed, what matters is that the SPD has a surge current rating or Nominal Discharge Current Rating that is suitable for the application and, probably most importantly, that the SPD limits the transient overvoltages to levels that prevent damage to the equipment being protected given the expected surge environment. In each mode, current flows through the SPD. What may not be understood, however, is that a different type of current can exist in each mode. Under normal power situations when “clean power” is supplied within an electrical distribution system, the SPD performs minimal function. In the awaiting mode, the SPD is waiting for an overvoltage to occur and is consuming little or no ac power; primarily that used by the monitoring circuits. Upon sensing a transient overvoltage event, the SPD changes into the Diverting Mode. The purpose of an SPD is to divert the damaging impulse current away from critical loads, while simultaneously reducing its resulting voltage magnitude to a low, harmless level. As defined by ANSI/IEEE C62.41.1-2002, a typical current transient lasts only a fraction of a cycle (microseconds), a fragment of time when compared with the continuous flow of a 60Hz, sinusoidal signal. The magnitude of the surge current is dependent on its source. Lightning strikes, for example, that can in rare occurrences contain current magnitudes exceeding several hundred thousand amps. Within a facility, though, internally generated transient events will produce lower current magnitudes (less than a few thousand or hundred amps). Since most SPDs are designed to handle large surge currents, one performance benchmark is the product’s tested Nominal Discharge Current Rating (In). Often confused with fault current, but unrelated, this large current magnitude is an indication of the product’s tested repeated withstand capacity. From IEEE Std. C62.72: The Nominal Discharge Current Rating exercises an SPD’s ability to be subjected to repetitive current surges (15 total surges) of a selected value without damage, degradation or a change in measured limiting voltage performance of an SPD. The Nominal Discharge Current test includes the entire SPD including all surge protective components and internal or external SPD disconnectors. During the test, no component or disconnector is permitted to fail, open the circuit, be damaged or degrade. In order to achieve a particular rating, the measured limiting voltage performance level of the SPD must be maintained between the pre-test and post-test comparison. The purpose of these tests is to demonstrate the capability and performance of an SPD in response to surges that in some cases are severe but might be expected at the service equipment, within a facility or at the installation location. For example, an SPD with a nominal discharge current capacity of 10,000 or 20,000 amps per mode means the product should be able to safely withstand a transient current magnitude of 10,000 or 20,000 amps a minimum of 15 times, in each of the modes of protection. From IEEE Std C62.72: The greatest threat to the long-term reliability of SPDs might not be surges, but the repeated momentary or temporary overvoltages (TOVs or “swells”) that can occur on the PDS. SPDs with an MCOV – that are precariously close to the nominal system voltage are more susceptible to such overvoltages which can lead to premature SPD aging or premature end-of-life. A rule of thumb that is often used is to determine if the MCOV of the SPD is at least 115% of the nominal system voltage for each specific mode of protection. This will allow the SPD to be unaffected by the normal voltage variations of the PDS. However, aside from sustained overvoltage events, SPDs can age, or degrade, or reach their end-of-service condition over time due to surges that exceed the SPDs ratings for surge current, the rate of occurrence of surge events, duration of the surge, or the combination of these events. Repetitive surge events of significant amplitude over a period of time can overheat the SPD components and cause the surge protective components to age. Further, repetitive surges can cause SPD disconnectors that are thermally activated to operate prematurely due to the heating of the surge protective components. The characteristics of an SPD can change as it reaches its end-of-service condition – for example, the measured limiting voltages can increase or decrease. In an effort to avoid degradation due to surges, many SPD manufacturers design SPDs with high surge current capabilities either by using physically larger components or by connecting multiple components in parallel. This is done to avoid the likelihood that the ratings of the SPD as an assembly are exceeded except in very rare and exceptional instances. The success of this method is supported by the long service life and history of existing SPDs installed that have been designed in this fashion. With regard to SPD coordination and, as stated with regard to surge current ratings, it is logical to have an SPD with higher surge current ratings located at the service equipment where the PDS is most exposed to surges to aid in the prevention of premature aging; meanwhile, SPDs further down-line from the service equipment that are not exposed to external sources of surges might have lesser ratings. With good surge protective system design and coordination, premature SPD aging can be avoided.